Charlie Mulgrew and James Forrest were honoured by their peers. Celtic duo Charlie Mulgrew and James Forrest have been named PFA Scotland Player of the Year and Young Player of the Year respectively. 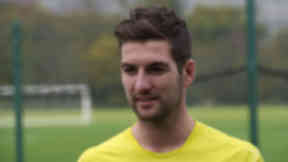 Scotland defender Mulgrew, who was named SPL player of the month for April, was favourite to win the prize after helping the Parkhead club to the SPL title. Club team-mate Forrest also gained recognition for his part in the Hoops’ title triumph after making over 40 appearances this season, scoring nine goals. Ross County’s Derek Adams was crowned Manager of the Year after leading his men on a 34-game unbeaten run as they won the First Division championship. Falkirk’s Farid El Alagui was named the best player in the First Division with Cowdenbeath’s Jon Robertson and Alloa’s Stevie May claiming the Second and Third Division prizes. Robertson, 23, has already agreed to join SPL side St Mirren in the summer while teenage striker May is expected to return to parent club St Johnstone after scoring 19 goals in 22 appearances for Paul Hartley's men.